Blues Traveler is a rock jam band, formed in Princeton, New Jersey in 1987. The band has been influenced by a variety of genres, including blues-rock, psychedelic rock, folk rock, soul, and Southern rock. They are known for extensive use of segues in their live performances. 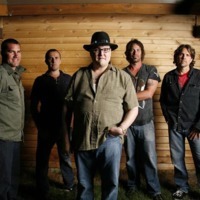 Currently, the group comprises singer and harmonica player John Popper, guitarist Chan Kinchla, drummer Brendan Hill, bassist Tad Kinchla and keyboardist Ben Wilson. Tad Kinchla and Ben Wilson joined the band following the death of original bassist Bobby Sheehan in 1999 of a drug overdose in New Orleans, Louisiana. While Blues Traveler is best known among fans for their improvisational live shows, the general public is most familiar with the group from their singles "But Anyway", "Run-Around" and "Hook". They gained mainstream radio popularity from their fourth studio album Four, released in 1994. Sheehan's death and Popper's struggle with obesity put a damper on the group's success, and A&M dropped the band in 2002. However, the band took this transition period as an opportunity to start in new directions musically, going largely independent and releasing on smaller experimental labels. Recently, Blues Traveler recorded a "best-of" collection of older songs reinterpreted with acoustic instrumentation called Cover Yourself, released October 2007; a new studio album, North Hollywood Shootout, was released on the Verve Forecast label August 26, 2008.